If you’re a regular around here, you may have noticed a few changes lately. The blog got a mini-makeover this week! I took a big step this time and actually hired a website designer to do some of the work. We beautified the search box, gave the navigation bar a simple hover effect, added a cute little comment bubble below each post & switched over to Disqus, which will hopefully make commenting easier! Each category page now has the most popular posts smack-dab at the top and, what might be the most exciting, we added a recipe gallery. At last, neat & tidy collections of the blog’s yummy recipes all in one spot. And, since we’re talking changes, I want to get your thoughts on something. Something big. What you probably don’t know is before I ever considered becoming a Registered Dietitian, I had my heart set on going back to school for design. I enrolled in a drawing class, took sewing lessons and began to build myself a portfolio. Sure, looking back it was a total quarter-life crisis, but at that point I had yet to find something that inspired me every day. Design seemed to be it. And then I found nutrition, or rather, nutrition found me. I traded my charcoal pencils in for a molecular model kit and suffered through General, Organic and Biochemistry. Before I knew it I was starting my Master’s at UNC. Quarter-life crisis averted. I started this blog during my first semester of grad school as a creative outlet -to combine my passion for nutrition and healthy living with my inner designer, my love for food, writing and photography. Obviously since then, the blog’s evolved. It’s grown and so have I. I’ve steered away from posting photos of every sweaty workout and every morsel of food I put in my mouth. I began incorporating other things that excite me as well. Like fashion. Home decor. Blog design. Beauty. Life. Which brings me back to that thing I want to pick your brain about. For the past six months or so I’ve been contemplating a blog rebranding. As in this exact blog only with a new name and a different home on the web. Nutrition is a huge part of my life, something I will never tire of writing, or talking about for that matter but I envision my blog being as much about lifestyle as it is health, not just my healthy lifestyle. To add to this, I just got married and found my dream job. I can’t help but think how those major life changes will influence me and furthermore, this little blog. If I rebrand, which will undoubtedly require a ton of time and more than a few headaches, choosing a name will certainly be the toughest part. As of now, I’m contemplating According to Elle or my new, married name, Elle Penner. I’d love to hear your thoughts -to rebrand or not, name ideas and for you bloggers, if you’ve ever considered or gone through with rebranding as well! I found this article by googling “re-branding blog” and was curious if you are in fact going through with it. If you are, I’d love to chat with you about your process and how it is going. A rebranding is crazy amount of work but I know how to you feel. I think we all especially after life changes start to think about what we are putting out in the world. Go for it lady! I like according to Elle that way you can write about many topics! Absolutely love what you have done with the blog- it looks great! I get where you’re coming from with the want to rebrand, your blog really does have to grow with you. Although, I understand why you’re worrying about maybe losing some followers/etc. I believe that if you do it right (which knowing your blog, you inevitably will) it will turn out amazing and gain you even a new demographic of followers! As for the name, I’m all for, Elle Penner. I think that it’s classy and elegant sounding. And using your name wouldn’t put any boundaries in front of what you want to write about (so it allows you to continue to evolve). Where as with “According to Elle” I think it sounds more opinion based (I really do like either one though). I’m excited to see what you come up with and continue to follow you and your wonderful blogging adventure! Follow your heart with the rebrand- in the end, you’ll know what to do! After thinking about it….I’m finally ok with the thought of losing “Nutritionella”…..
“According to Elle” gets my vote….but whatever you choose….bring back those heels…lol. Whatever name you choose, your readers will read! I think a r-branding is sometimes necessary, not just for a blog but occasionally in life. New things will excite us or fade away to take a backseat as we grow and change, and that’s totally okay, and healthy. :) Do what you’ve got to do, gf! Re-branding is always something that takes a lot of thought and consideration. I love the brand you’ve developed so far but I agree with you that if the focus of the blog is moving away from a mostly nutrition/health focus that maybe a new name is needed. I think According to Elle is a good choice. It’s not quite as personal as using just your name (this is good I think) and it’s broad enough to cover anything you may want to write about. Also, it’s easy to switch the user names on your Twitter, Instagram and Pinterest accounts so re-branding isn’t like starting over. Just be sure to keep the nutritionella domain for awhile and have it redirect to your new site so that any existing incoming links won’t break. Whatever you decide, Go Elle Go! According to Elle covers it all. Love it! 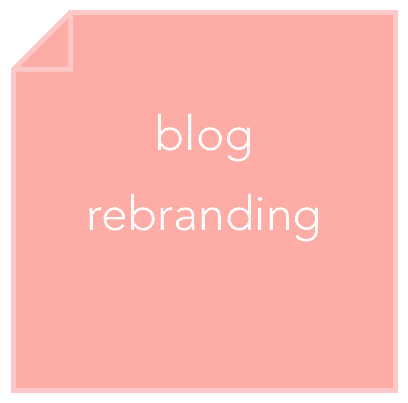 I’m sure rebranding is something so many bloggers consider at one time or another. It’s only natural as our interests evolve over time! I’m sure whichever you choose you’ll do a great job with the content and design and it will be a place that people love to visit. :) For the record, I think ‘according to elle’ has a nice ring to it! Go for it! I am much like you – my love of home decor, photography and DIY has started to take over and wants to come out and on to the blog. I’ve decided to wait until I’ve done school (and my bluehost contract runs out) before moving the blog or changing it, but if the time is right than go for it! I would definitely, definitely follow you wherever you choose to go. Go for it! I think its a GREAT idea. (Maybe have a tab still at the top for nutrionella where you can have all your nutrition related posts). Cause the name is awesome. Gosh, I can relate to this post SO much. I have always had a love for design as well and even took two drawing classes in between my anatomy & gen chem classes because I wasn’t sure if I wanted to do design or nutrition (so I can relate to the quarter-life crisis part). I really love love love the nutritionella name but I can also completely understand if you want to rebrand and take your site in a different direction. Either way, it’s your choice and I think you should go with you instinct! I love According to Elle! It’s cute and catchy. I also support your decision to make this more of a lifestyle blog. To be honest, I’ve gotten sick of healthy living blogs where it’s all about every meal and every workout. it gets repetitive! I changed my blog name a couple years ago, and it was super simple, but mostly because I didn’t have any followers at the time! Similarly, I had a name focused around a specific topic (baking) and wanted something broader. The upside is that there are a lot of tech things you can do to maintain traffic to the new site (maintaining both URL and setting up a 301 redirect). The biggest downside I’d guess for you is keeping followers through social media: for example, you wouldn’t be able to change the name of your Facebook page (I’m not sure about the rules for other social media). But on the other hand, it’s a lot of FUN to create and design a new blog! If that’s what you’re most excited about, then go for it!